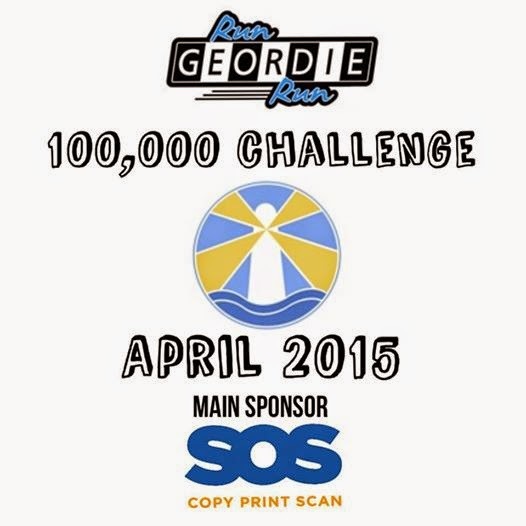 Regular followers of Run Geordie Run will need no reminding of how and why I came to be a fundraiser. It all started in 1994 doing the Great North Run in aid of St. Benedict's Hospice. The staff at the Hospice cared for my Mam during her final days battling cancer. In 2009, I decided to fundraise for a local children's charity. There are so many brilliant ones in the region but it was The Children's Foundation that was chosen for their broad range of projects and the amount of children that the money reached. In 2012, after 18 years of fundraising for St. Benedict's Hospice, I decided to switch my fundraising attentions from palliative care of terminally ill people that the Hospice provides to a charity that funds treatment and research; The Sir Bobby Robson Foundation. You can read more about that decision here. I make no apologies for constantly talking about amounts raised. That cash is the ultimate fuel for my running feet. The opportunity to raise those funds for such wonderful charities has made coping with the death of my parents more bearable. When I announced details of the Run Around The World last year I said the following when talking about the pain of grief "Thankfully, through fundraising, I have found a way to control and even some days numb the pain. There is no doubt in my mind that raising funds for such good causes as The Sir Bobby Robson Foundation and The Children’s Foundation has been as beneficial to me as it has to them and the beneficiaries of their charitable good deeds.". Anyway, back to the main point of this blog post. You'll notice that the amount raised for St. Benedict's is just short of £100,000. It's a mere £578.09 away from that 6 figure sum. That, dear readers, is what I like to call "unfinished business". In an attempt to try and break through the £100,000 barrier for the Hospice I'll be running the Virgin London Marathon in April. I'll be calling it my 100,000 Challenge. The London Marathon is a tough event and I want to do the Hospice proud in memory of my Mam and Dad. With a bit of luck and the continued generosity of so many kind people I'm sure it will be a success. If you would like to sponsor the 100,000 challenge then please do so at my Virgin Money Giving Page here.